The length of the waveguide from the magnetron is chosen to reduce back reflected power from the cavity to protect itself. The waveguide feeding from the magnetron into the cavity is a separate entity. So its hard to really understand what you are talking about. Cut off frequency and mode shapes for different cavity shapes have been described long ago and proven again and again, so I'm not sure what this has to do with Sawyer and his (strange) calculations. Don't forget about the nonreciprocity of Nitrogen papers. Imagine the implications of having the speed of light depend on its direction in a medium. And I don't see how you will get repeatablity with a nasty old maggie, unless this is a brute force effect. A Klystron based source would be a better option IMHO. ...Don't forget about the nonreciprocity of Nitrogen papers. Isn't the magnitude of this effect (nonreciprocity of Nitrogen papers), regarding a thrust force even smaller than the magnitude for the chiral polymer ? The guy in Romania has the magnetron antenna clearly placed inside the frustum. And yes it is a brute force effort and will likely burn out his source if he pushes it. Luckily they're a dime a dozen. He's in Romania, so we have no idea what sort of regulatory environment they have there. Even in the US, nobody is going to notice noise in the ISM band for 40 seconds. Those in the US might not want to post on the internet what they're doing with magnetrons without consulting the FCC first. The spoils go to those who are bold enough to try. The trick is to accept and manage risk appropriately. If you aren't willing to take risk, you'll never even get the chance to fail. 1) microwave feed from magnetron to tapered waveguide / cavity is tuned for best feed. 2) overall length (up and down) of the tapered waveguide / cavity is adjusted so it resonates with the applied Rf or the applied Rf frequency is altered to achieve resonance between the 2 end plates. This is what Shawyer was doing physically in his 1st and 2nd EM Drives. Note tuning mechanism on top of the 1st test device and extensive stepper motor length tuning system on end of the 2nd device. Last attachment shows what I believe the left side tuning system was doing inside the fixed diameter cylindrical section. 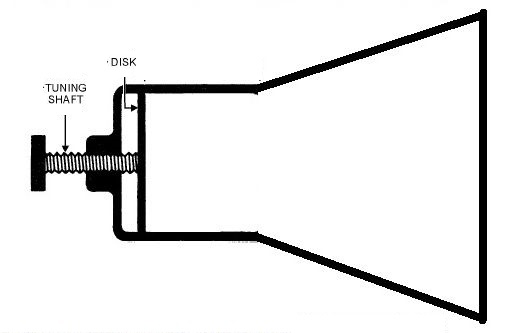 The Rf signal must achieve length resonance for the EM Drive to deliver thrust. No resonance, to thrust. I also believe the DF should get very close to 1 at the same applied Rf frequency. So 3 dimensions to tune to get optimal thrust production. Get Df close to 1 at Rf frequency via small & big end diameter adjustments and get cavity length resonance to the applied Rf frequency via adjustment of the spacing between the end plates. Get one or both wrong and there will be no thrust. Explain to me if I'm light in a medium that forced to go faster than the medium allows, what laws have I broken? Blame it on me sitting in my hot tub watching the waves interact in ways faster than they normally would just by going across the water. . . and also needing a break. Can you turn the drive on and off rapidly so that it lengthens the oscillation of the pendulum, like a child's swing? It would have to be computer controlled.. The period might be less than the engine response time though. I'm thinking of running through the math on this. Here are the 1st cut of the Flight Thruster dimensions based on Df = just below 1.0 and length resonance. I'm impressed the dimensions are VERY close to those calculated from the Flight Thruster picture. 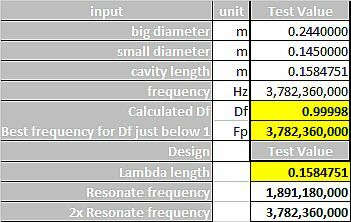 The calculator lets me set the big and small end dimensions to get Df just below 1 at a calculated frequency close to the 3.85GHz design frequency. Then using the What If capability, the cavity length is auto adjusted to get resonance at the same frequency that generates a Df just below 1. Attached are the Flight Thruster dimensions and resonate frequency that lock the 2 optimal frequencies together. While 3.78GHz is not 3.85GHz, it is close enough for my variable Rf frequency generator to lock on. Time to start getting serious and design, build and test the Teeter Totter balance beam thrust measurement system and data capture & logging system. Shawyer has said Df = 1 is the max value to consider in the real world. Which I have done. Try these dimensions and frequency and see what Df you get? Note both the DF = 1 frequency and cavity length resonance frequency are the same and that the cavity dimension are close to those workout on this forum. So the guys who did that work were close. Check the Df at the quoted frequency and let me know the Df? Lucky that Nasa hasn't stopped the experiments. It would be a more than a little upsetting if they stoped the progress Eagleworks has made.